Push Button Kill / Stop Switch Universal Style. Fits a 7/8" round hand bar. Comes with a 48" long single wire. You get the grounding via the frame. 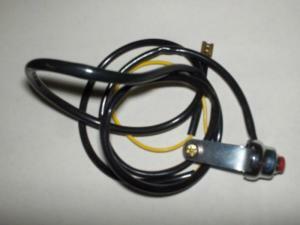 This switch is used on most of our friction drive kits. It has a male spade connection end. Let us know what engine you have, use the text box to enter your details.